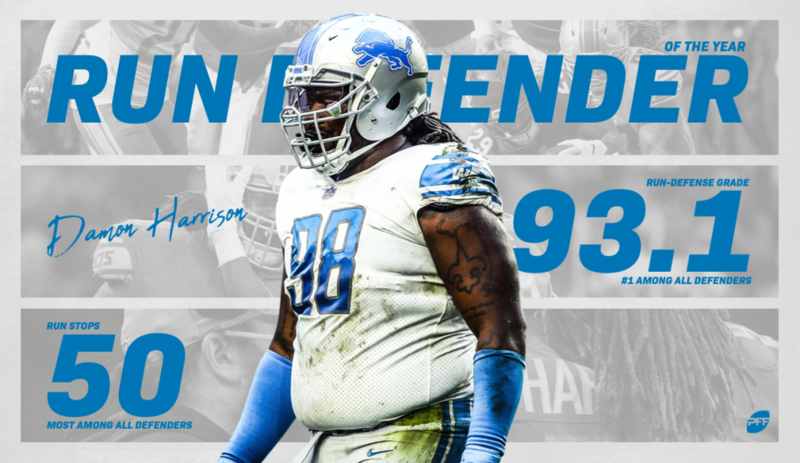 Damon Harrison added yet another chapter to his prolific run-stopping career, as his 93.1 run defense grade this past year makes 2018 the fourth consecutive season in which he has achieved an elite grade at the discipline. This year he pulled a new rabbit out of his hat, as he was traded from the Giants to the Detroit Lions after Week 7 and did not skip a beat despite the new scheme and personnel around him. His 50 total run stops led all defenders regardless of position this year, and his 30 with Detroit alone (10 games) would have ranked fourth among all interior defenders over the course of the entire regular season. In addition, 17 of his solo tackles were either for no gain or for loss, tying him with Carolina’s Kawann Short for first among the league’s players at the position. His tackling as a whole was outstanding this year, as his 60 solo tackles against the run again ranked first at his position and placed ninth among all defenders. He also missed just one tackle on the season, a remarkable feat considering only four defensive interior players with at least 20 tackles (one of them being Detroit teammate Da’Shawn Hand) did not register a single miss, and none of them notched more than 30 solo tackles in 2018. Perhaps the most impressive part of Harrison’s season was his impact on the Lions’ complete turnaround against the run once he entered the lineup in Week 8. Through Detroit’s first six games (their bye came in Week 6) the defense had a cumulative run defense grade of just 69.0, which ranked 26th in the league, and their 81 run stops ranked 21st. Over the final 10 weeks of the regular season, the Texans led the league with a run defense grade of 91.8, just edging out Detroit (91.7), and the Lions also ranked third in run stops over that stretch. Trading for Harrison before the in-season deadline proved a brilliant move for the Lions this year and considering his consistent track record of complete dominance against the run; the move should continue to pay dividends in 2019 and beyond.